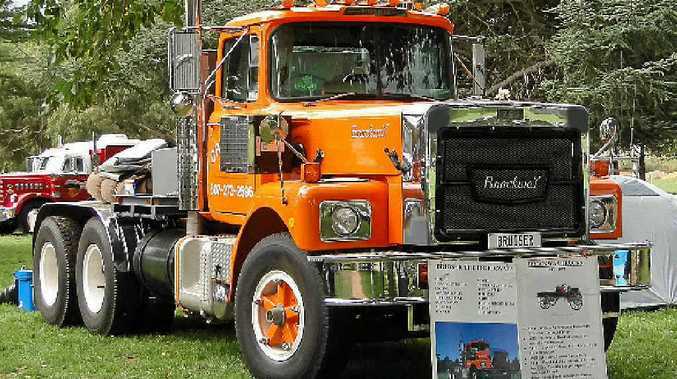 NOT FORGOTTEN: Ed Eminson’s classic 1975 Brockway is a rig of renown. ED Eminson is a lover of Brockway, a truck that has sadly passed into history. Kermie: Nice truck Ed. That bright orange paint job matches your ruddy cheeks. K: Not a truck we see every day. What sparked your interest in Brockway? Ed: Started back in the 90s. I bought a couple of 1930 models. I had a truck encyclopaedia which said Mack bought them in 1956. I rang Mack to get more info but they weren't interested so I checked out the internet. This was in 2000 and the town of Cortland, USA was holding the first ever Brockway truck show. I couldn't resist so I hopped on a plane to have a look see and find out more about the brand. I went into a shop that had the Brockway emblem - a Husky - and was amazed that the owner knew who I was. Turned out that my wife had been in touch with the Brockway committee and the whole town knew that a nutcase Aussie was coming from the other side of the world to see their 'little' truck show. K: And that's where you came across this beast? Ed: Yep. There were 100 trucks on display and this stood out like the proverbials. He's a 1975 F761TL with a 475hp 8V92 Detroit under the bonnet. K: So you bought him then and there? Ed: I wish. I went back to the show every year for the next seven years and in 2007 I was told he was for sale. I rang my wife, Amanda, back in Oz and asked her what her favourite colour was. With her bright orange hair I knew what the answer would be. "Orange," she snapped. "And it's 3am!" Told her I'd bought her a present to match her hair. She said, "Terrific. Now can I go back to sleep?" Cutting to the chase, I eventually got him back to Oz. Took a hell of a lot of money, time and grief but was worth all the effort. K: Most people I speak to refer to their trucks as 'her'. You call the Brockway 'him'. Ed: He's called 'Bruiser'. Ever heard a girl called that? K: Fair call. So what about the history of the brand? Ed: The company started in 1912 and went until 1977 when Mack closed it down. They were hand-made to customers' requirements. A big truck in their day, they were popular for interstate, off-highway use and for snow ploughing. There's still plenty operating in the States today. They also had a good slice of the Australian market in the 1920s and 30s. They were the most rugged truck in the world and that Husky emblem typifies the brand. Huskies can beat the crap out of any old bulldog. Ed: Every time I'm behind the wheel Kermie.